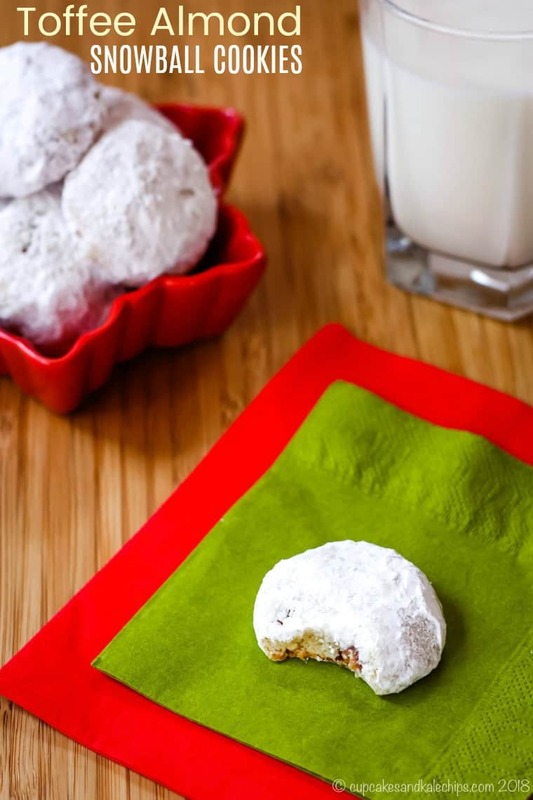 Buttery, nutty, crumbly cookies with bits of toffee, double-rolled in powdered sugar. Get your coffee cup ready! 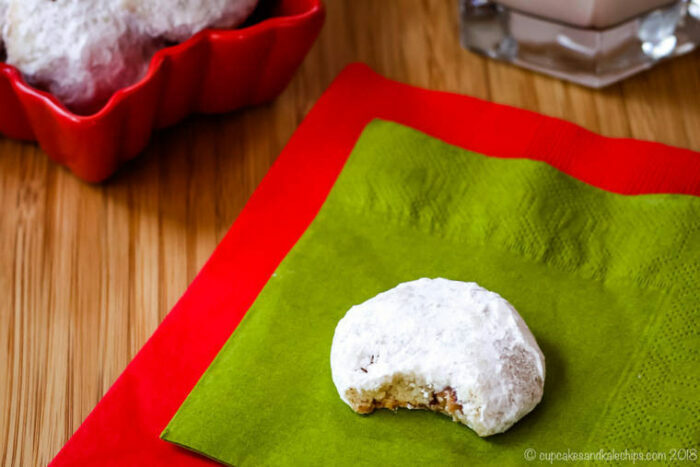 Toffee Almond Snowball Cookies take the classic Christmas cookie recipe and make it even more irresistible. 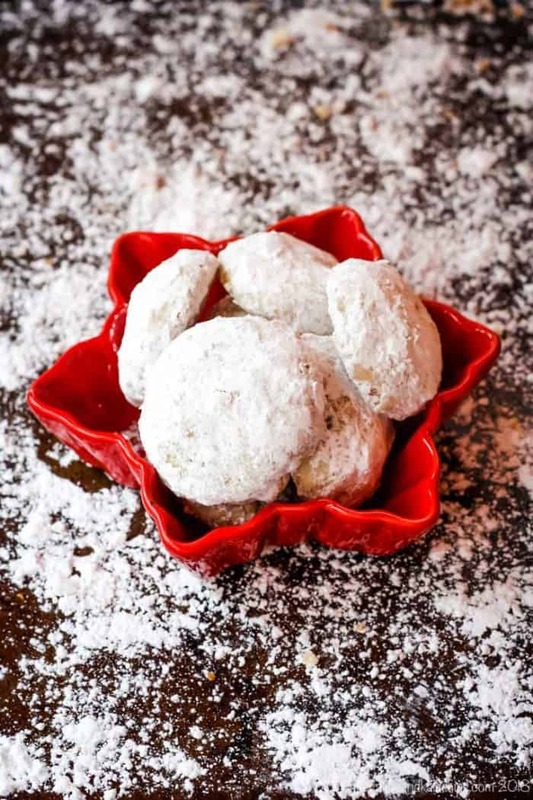 Your traditional snowball cookies are buttery and tender, but they are not complete until they are double-rolled in powdered sugar. Now add the nutty flavor from almonds and rich toffee bits and you have a flavor combination like you’ve never had before in this old favorite. 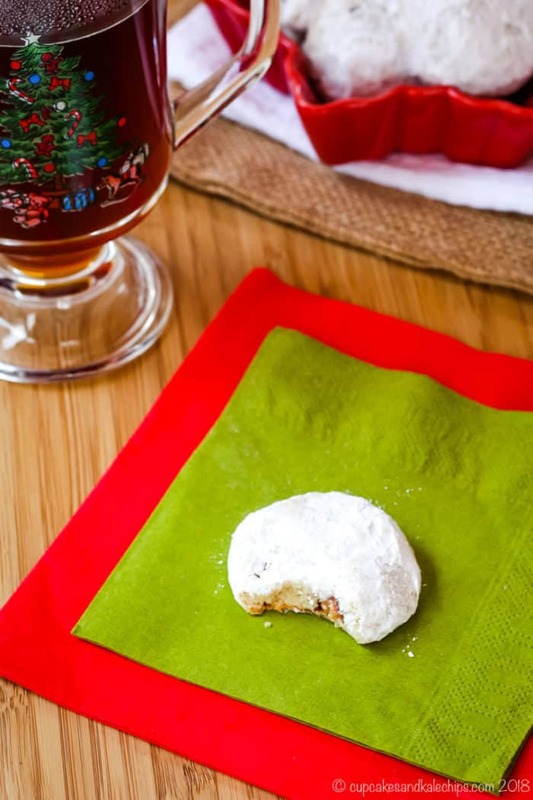 Santa might be tempted to make a repeat stop at your house when you make this Toffee Almond Snowball Cookie recipe. In case you didn’t see on my Facebook page, Sunday was my mom’s 60th birthday! How amazing is that?! She is pretty amazing, too! I told you all about that last year, when I shared her favorite cookie, the classic Snowball, which she likes with walnuts. My favorite Christmas cookies are Almond Crescents. So I thought I would combine the two, then add some chopped toffee pieces. As much as I love Almond Crescents, or, technically, now my Gluten Free Almond Crescents, the chocolate dipping part becomes a little annoying. This is mainly because the recipe makes so many cookies, and I am slightly obsessive compulsive when it comes to chocolate dipping. I also love making the Snowballs for her, but the timing has to be right for the cookies to not be too hot to crumble, but warm enough for the powdered sugar to melt slightly and stick. But all three of these cookies are so yummy that they are worth it. Plus, you know, it’s mom. And Christmas. And cookies. How do you make these cookies? Start off by creaming together powdered sugar and softened butter with a hand mixer or stand mixer. You can actually make these cookies just with a wooden spoon. Its’s a bit more work, but I suppose it burns off a few more of those cookie calories. Gradually add the flour and then the ground almonds until it forms a thick dough. It might appear crumbly and sandy at first, so just keep mixing. The dough will come together. Using a wooden spoon or spatula, work the toffee bits into the dough. 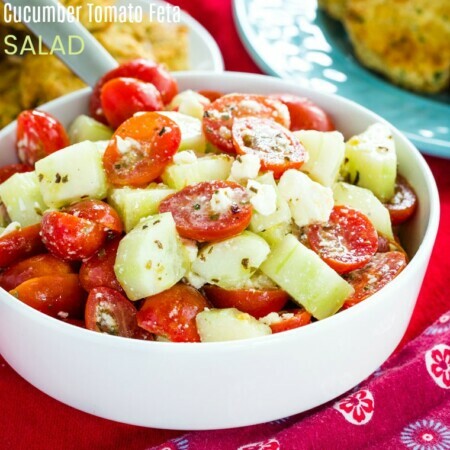 Using about a tablespoon of dough, form balls and place on a cookies sheet. Do not flatten them. Bake until set and barely golden but not browned. Let cool slightly and roll in powdered sugar. One they are completely cool, roll a second time in more powdered sugar. These Toffee Almond Snowball Cookies spread a little more than the original Snowball. 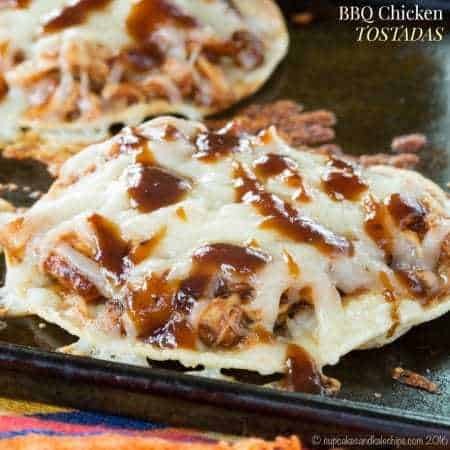 Therefore, you will definitely want to chill the dough and bake them on a baking sheet lined with parchment paper. I recommend baking these on parchment paper, and let them cool for right around five minutes on the sheet. This will help them to “set” a but, but they will still be warm enough for the sugar to stick. DOUBLE ROLLING is the key to a perfect Snowball cookie, so while the cookies are baking, put powdered sugar in a shallow bowl or baking dish. After they come out of the oven, let them cool on the sheet for just a few minutes so they cool enough that they don’t crumble, but warm enough for the sugar to stick. Roll the warm cookies in powdered sugar until they are completely covered, the place on a cooling rack. After all the cookies are coated, cool them completely. Then roll one more time in more powdered sugar for that nice powdery coating. Can you freeze snowball cookies? If you are making these or any of the 15 Recipes for Snowball Cookies You Must Bake This Winter., you probably want to know if you can bake them ahead of time and store them in the freezer. The answer is YES, this is definitely a freezer-friendly cookie recipe. You can either freeze the dough and bake them when you need them. Or another option is to freeze the cookies after they are baked. Just be sure to freeze them after rolling them in powdered sugar or it won’t stick. You could just do the first rolling, then do the final roll after you thaw them out. And also make sure to put them in an airtight container before freezing the cookies. I actually prefer to put them in a plastic zipper-top freezer bag and squeeze out all of the excess air. Then place the bag in a cookie tin or other storage container that will prevent them form getting crushed in the freezer. 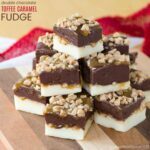 What else can you make with toffee bits? What do you need to make snowball cookies? 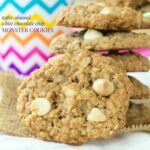 INSULATED BAKING SHEETS – I don’t always use insulated baking sheets, but I like them for these cookies. Unlike many other cookies, you actually don’t want these to get too golden brown. But they are thick balls that don’t flatten out, so they need some time to bake through the middle. 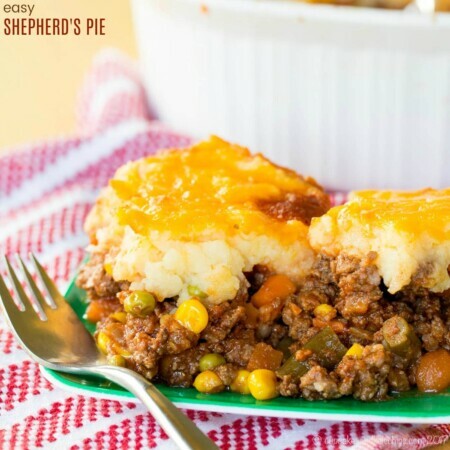 The insulated baking sheets ensure the bottoms don’t brown too much while they are baking. 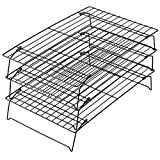 COOLING RACKS – After you roll the cookies, you do want to set them on a cooling rack to cool completely before the second rolling. I prefer the stackable ones so that I can save counter space while cooling a bunch of cookies. 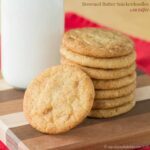 HAND MIXER – For some cookie recipes, I break out my KitchenAid stand mixer, but this recipe doesn’t make a huge amount of dough, so the giant bowl is a bit of overkill. I still use my little Hamilton Beach hand mixer and that little guy is still kicking. And I’ve made some serious tough cookie doughs with it. And if it dies, I can replace it for only $15. A new spin on an old favorite these buttery, nutty, crumbly cookies get eve better when you add bits of toffee. Then finish them off with a double roll in powdered sugar. Santa won’t be able to resist, and neither will you. So bake a batch, pour a glass of milk or a steaming cup of coffee or tea, and one or two, or heck, even a half dozen. It’s the holidays! In a large bowl, cream the ½ cup sugar, and butter using a stand mixer or hand mixer. Gradually add the flour and then the ground almonds, and mix until well combined. Using a wooden spoon or spatula, stir in the chopped toffee. Chill dough in the refrigerator until firm. Form into balls using about 1 level tablespoon of dough and place on ungreased cookie sheets, preferably lined with parchment. 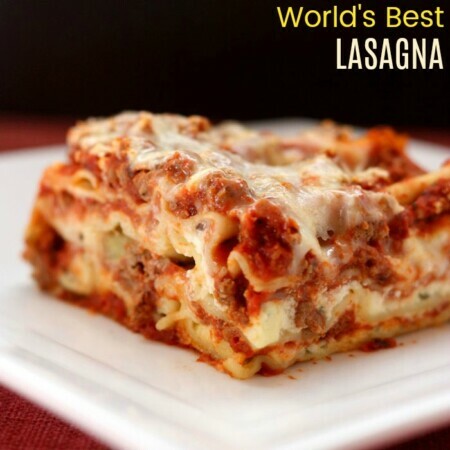 Bake for 8-10 minutes, or until barely set, but not browned. Cool on the pan for about 5 minutes, then roll the warm cookies in powdered sugar, and place on a rack to cool. Once cooled completely, roll in powdered sugar again. Also make sure you check out all of today’s amazing #CookieWeek recipes! I’m not usually a huge snowball fan but THESE would totally change that!!! I love toffee! I hope you have a chance to try them, Kayle! These cookies look wonderful Brianne! Snowball cookies are one of my favorites and I love your toffee almond version 🙂 Thanks for sharing and hope you have a great week! Thanks! Snowballs are such a favorite in my family that after making them the same for so long, I had to try something new. These look yummy. I might make them for our neighborhood cookie exchange. Thanks! i think my favorite cookie to take to swaps would be the red velvet cookies or lime cutaways. I still have to try red velvet cookies. And I am curious about the lime cutaways. I have to make a lime recipe for a post next month. my peppermint twists. everyone loves them. I just made snowballs too, but a different flavour. Love your version! 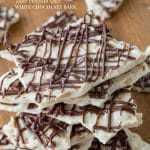 A great basic cookie to make lots of variations! so usually I’m kinda eh about snowball cookies::: but no more!! 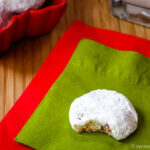 These are TOFFEE ALMOND snowball cookies and they sound incredible! What lucky boys you have!